Kozun, Leivo Deserve It, But Will Leafs Keep Orr? As Training Camp inches closer to the start of the regular season – and I mean inches – injuries to veterans and strong camps by some young players have perhaps opened the door to some players who were not thought to have a good chance to make the team when camp began. 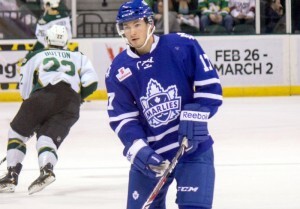 Two of these players are Brandon Kozun and Josh Leivo, who, along with recent draft pick William Nylander, remain in Camp after having survived the latest round of cuts (Kontiola, Carrick, Granberg,Brodie, Gauthier, Valiev, and Tallinder did not) Since outside of extremely hard-core fans, not much is really known about them, I thought it would be worth writing up a couple small profiles. A sixth round pick by the Kings in ’09, Kozun stands only 5’8″ and is 180 lbs. Or he stands 5’7″ and is 168 lbs – it depends where you look, but suffice to say, he’s small for a hockey player. The 24-year-old right-winger once scored 40 goals in the WHL and has averaged 20 goals over 4 seasons in the AHL, Last year he scored 17 split between LA’s farm team and the Marlies, after being acquired in a trade for Andrew Crescenzi last January. By all accounts, Kozun is a strong, speedy skater who excels offensively but, obviously, is undersized by NHL standards. Despite the size issues, Kozun is also an adept defensive player, perhaps owing to his speed. Kozun is said to be having a great camp and has so far avoided being cut, although he is unlikely to make the final team. Still, he’s worth keeping on your radar as injuries may give him a chance to get a few games in this year with the Leafs. While he’s unlikely to ever be an impact player, you can never have too much skill and a player such as this could easily come in handy once the injuries start to mount, as they inevitably will. 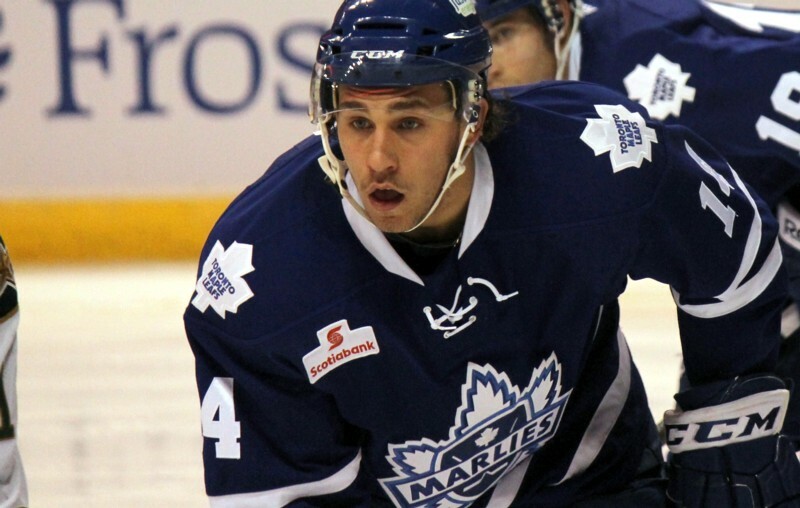 Unfortunately, if the Leafs choose to cut Kozun, they risk losing him to waivers. A right-handed player capable of playing both wings, Leivo is a nice combination of size (6’2, 180 lbs) and skill. Leivo,21, has had perhaps the best camp of any young Leaf hopeful, scoring 3 points in 4 games so far. Drafted in the third round, 86th overall, by the Leafs in the 2011 draft, Leivo stands a decent chance of breaking camp with the team. Last season, his first full AHL season, saw Leivo pot 23 goals and 42 points in just 59 games. Those 23 goals were good enough to lead the team. Leivo also had a strong camp last year and was one of the last cuts. The Leafs, who were regularly out-shot last season, have to appreciate that in Sundays game against Buffalo, Leivo had 4 shots make the net and an additional 5 that were blocked. One strike against Leivo is that he does not have to clear waivers to be sent to the AHL. Another is that Coach Randy Carlyle seems intent on carrying Colton Orr. Regardless of whether he starts with the Leafs, it is almost assured that Leivo will be suiting up for them at some point this season. According to Hockeysfuture.com Josh Leivo is an upward trending power-forward who is great down low as well as versatile. They also call him a “gifted athlete,” so that is good too. Overall, Leivo appears to be a bit of a steal for a third round pick and looks to have a ton of potential. Based on what I have seen, heard and read about training camp, it would seem that both Leivo and Kozun have done enough to warrant making the team. And yet, the only conclusion I can make here is that the Leafs might need a new coach. Despite having his entire staff replaced over the summer and being made very aware that his old-school ways were not thought highly of (the Leafs jettisoned much of their veteran management team and went with a younger, more advanced stats savvy group) Coach Carlyle seems intent on stubbornly holding on to his enforcers, as Orr and McLaren remain among the 18 forwards remaining in Camp. This despite the glaring obviousness that such players are no longer needed in the NHL. There is nothing wrong with fighting, in my opinion, but having a designated fighter on your roster, let alone two, seems about as relevant as a fax machine or pager in 2014. Let’s not forget that a similar move last season forced the Leafs to trade Joe Colborne to avoid losing him on waivers, only to have to go out and use a second round pick to acquire Holland when injuries came back in the form of Karma to remind them of their hilariously awful roster decision. If the Leafs will, as they say, give roster spots to those who deserve them, and not give preference to those on one way contracts or who have to be exposed to waivers in order to be sent down, then Leivo and Kozum do stand a legitimate chance to make the team. If however, the team, or the coach, insist on dressing Orr or McLaren, or, God-Forbid, both, the Leafs stand a good chance to lose quality assets as only Leivo and Nylander do not have to clear waivers to be cut. Why risk losing Carter Ashton or Kozun to waivers? I couldn’t tell you why, but I can tell you that it’s insane. Let us hope common sense prevails and that the Leafs choose to keep their young skilled forwards over their Toaster Oven and their VCR.